Explore stunning sandstone canyons, gaze out over mounds of sand dunes that stretch as far as you can see, and enjoy an unmatched view of the shining stars of the Milky Way Galaxy. These are just a few of the experiences that you can have at the Texas state parks in the Panhandle Plains, a region home to such cities as Abilene, Amarillo, Lubbock, Midland, and Odessa. Given all its diverse landscapes, no visit to any of the region’s state parks is the same. See what three of the region’s parks have to offer below and plan your next adventure to the Texas Panhandle today. Rugged sandstone cliffs, canyons shaded by verdant juniper and scrub oak trees, and wide-open plains where a herd of wild bison roam. 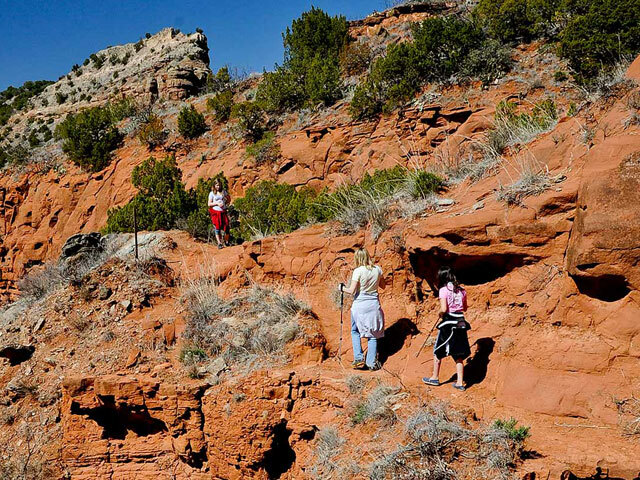 You’ll find all of this at Caprock Canyons State Park, a jewel of a state park home to breathtaking views, 90 miles of hiking and biking trails, and a 120-acre lake. The park’s hiking trails range from the easy two-mile Mesa Trail to the very challenging 2.3-mile Haynes Ridge Overlook Trail, both of which take you to jaw-dropping overlooks. Caprock Canyons is also a great place to see animals in their native habitat, from the bison herd to pronghorn antelope, white-tailed deer, bobcats, and as many as 175 species of birds. If you’re in the park from June through September, make sure to catch the emergence of thousands of Mexican free-tailed bats. When you’re not hiking, biking, or horseback riding, go for a dip or snag a few fish in Lake Theo. With so much to see and do, it’ll take you more than a day to get the most out of your visit. 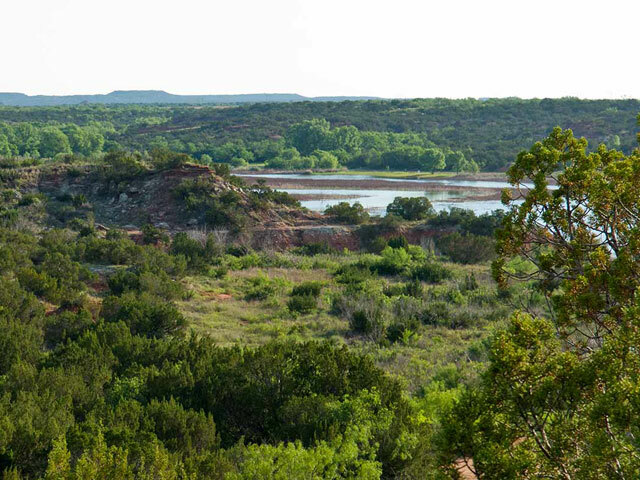 Fortunately, Caprock Canyons State Park has several campsites (and the spacious Lake Theo Lodge) where you can rest up for your next day of adventure. The bucolic hiking, mountain biking, and equestrian trails and a scenic lake perfect for fishing and swimming provide plenty of reasons to visit Copper Breaks State Park. Yet the real attraction just might be once the sun sets, as the night sky lights up with all the brilliant stars of our solar system. The park, located 90 miles west of Wichita Falls, is an International Dark-Sky Association Dark Sky Park. See it all on a clear night as you camp out at one of the park’s sites, then spend the next day celebrating all the North Texas beauty. With its gently sloping sand dunes, there’s nothing quite like Monahans Sandhills State Park here in the Lone Star State. As such, it’s also the place to do something unthinkable here in Texas: sand surfing. Rent a toboggan from the state park’s office and soar down the dunes, an exhilarating experience that will keep you entertained for hours. Along with all the sand surfing, the park is home to an 800-acre equestrian area with no marked trails, as well as a variety of campsites. 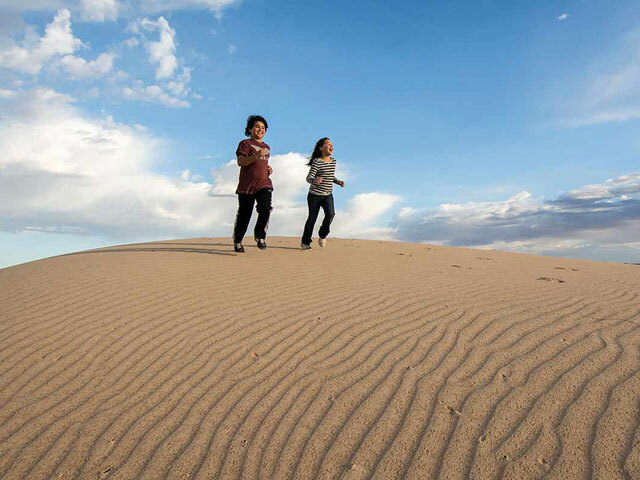 Located just 30 miles west of Odessa, Monahans Sandhills State Park is easy to reach.